The pool – also known as Heather’s Healing Pad – was funded in part by Leap-for-a-Cure, an organization spearheaded by the Roberts Family to benefit the Omaha community with brain cancer awareness, education and treatment. Although Heather Roberts lost her battle with brain cancer, she is still helping others overcome their own obstacles. 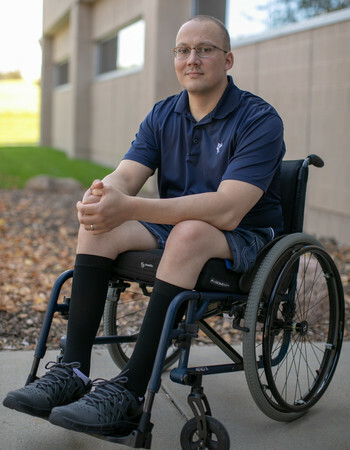 Mike Lambert, 38, has battled a diagnosis similar to Heather’s – spinal cord cancer. He’s using aquatic therapy to support a long healthy life, and he admits: Walking again would be nice, too. It all started in 2013. Mike and his wife were expecting their first child. An MRI showed lesions – too many to count – along his lower spine. His diagnosis? Anaplastic ependymoma or WHO grade III ependymoma – malignant spinal cord cancer. He underwent surgery in July 2013. The goal was for doctors to obtain a biopsy and “debulk” as much as they could from around Mike’s spine. While there were some lesions left behind, they weren’t of much concern. The surgery was successful. He received six weeks of proton radiation therapy, and by the end of the year, Mike was considered stable. It wasn’t long before routine scans started to show growth around his spine. Mike underwent chemotherapy and more proton radiation. Doctors also recommended infusion therapy, in which tumor-starving medication is delivered into a vein. It stopped the growth of his cancer, but it also depleted his energy level. The silver lining came in February 2018. Doctors had seen no growth in over two years and felt comfortable taking Mike off the treatment. He was once again stable, and his energy returned. Mike Lambert was diagnosed with spinal cord cancer at 32. Mike is a realist, but it’s clear he’s never had a shortage of optimism. 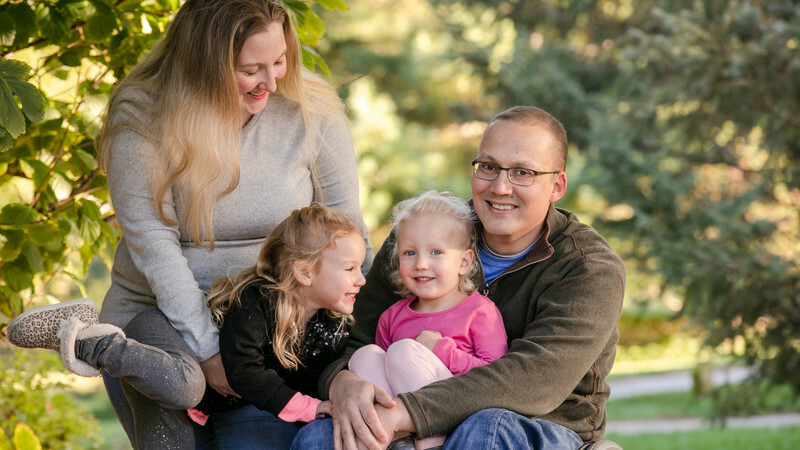 He has a lot of inner strength and three giant sources of motivation – his wife of nine years, Katie, and their two little girls – Izzie, 5, and Addie, 3. While he now has the energy to do such things, the cancer robbed him of his strength and feeling from the waist down. He’s now confined to a wheelchair. Doctors don’t know whether Mike will ever walk again. Mike was referred to Madonna Klein, PT, MPT, clinical coordinator of outpatient therapy services at Methodist Hospital. She oversees the Methodist Aquatic Therapy Program at Methodist Physicians Clinic HealthWest. Klein knew right away that Mike was the perfect candidate for aquatic therapy. This is beneficial when Mike tries to mimic the motion of walking. One of Mike’s aquatic therapists, Julie Jessen, PT, MPT, is excited about the physical progress he’s made. But if she’s honest, the mental progress he’s making is even more exciting. Mike’s work outside the pool is most telling of how far he’s come. first time, using Madonna Klein, PT, MPT, for support. Just weeks after his first aquatic therapy appointment, something amazing happened. Klein was working with him in the gym – guiding him to contract his thigh and lift his leg off a bolster. They had attempted similar movements in the past. After a couple of hard-fought tries, he succeeded. He kicked his leg off that bolster. And during a more recent gym session, Mike was able to power himself up into a standing position as Klein locked out his knees. While aquatic therapy has shown promising results in people suffering from cancer-related conditions, it doesn’t end there. So many people are benefitting from this “weightlessness” in the water. The Methodist aquatic therapy pool has helped orthopedic patients, stroke patients and patients like Anna Johnson, 34. She has spastic cerebral palsy. “Basically, you feel trapped in your own body,” she said. When Anna turned 30, she said, her body took a turn for the worse. She grew stiffer and weaker. Every move she made was challenging and exhausting. When she walked into her first aquatic therapy session at Methodist – she immediately noticed the warm and welcoming atmosphere. That alone was healing, she said. 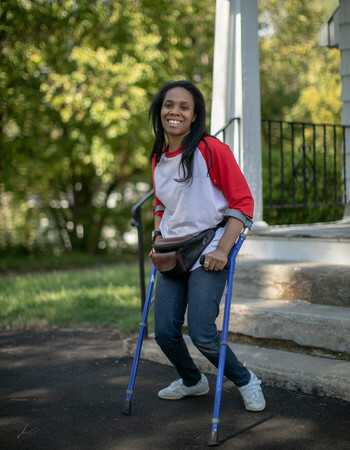 After just 22 sessions, Anna noticed a substantial difference – not only in how freely she could move, but how free she felt. Recently, Anna started land-based therapy, which has been very successful. “There’s no way I could do what I’m doing if it wasn’t for Julie and that pool,” Anna said. Anna’s story is similar to Mike’s. Both have unique conditions. Both have seen astonishing results. Both admit that what they found at Methodist has been unlike the rest of their care – it’s not one-size-fits-all. It’s individualized. It’s strategic. “And I just don’t think you get that at other places,” Mike said. And perhaps even more therapeutic than that patient-centered approach are those who provide it. taught him to value the time he’s given – to do more with his life and the people he loves. Mike with his wife and daughters - his driving forces in learning to walk again one day. Read Mike's full story in the Winter 2018 The Meaning of Care Magazine.